Sources say the Boeing 777 continued to attempt to transmit routine data about the plane's engines and performance to satellites. Malaysian authorities and Boeing apparently did not downlink the data, so details from plane's transmissions are not known. But, the fact that the jet was continuing to send signals is a strong indication that the jet did not crash immediately after radar contact was lost. The engines instead continued to run, Orr reports, meaning the plane continued in flight or perhaps was on the ground but still producing power. 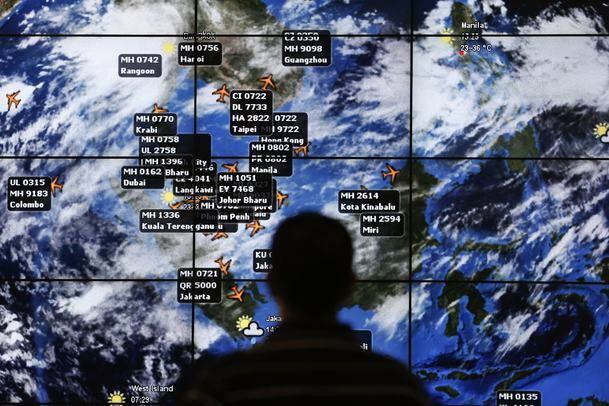 In addition, U.S. radar experts have looked at the Malaysian military radar track, which seemed to show the jet flying hundreds of miles off course west of its flight path, and back across the Malaysian peninsula. Sources say the radar appears to be legitimate and there is a strong reason to suspect that the unidentified blips - seen on military controller screens - are images of Malaysian Airlines 370. All of this, Orr reports, is leading to the possibility that the jet flew for hours towards the Indian Ocean. And it is the reason the search field is expanding in that direction. Investigators also said today that U.S. officials gave them reasons to keep searching the waters west of Malaysia, far from the flight path of the Malaysia Airlines plane. Malaysian Defense Minister Hishammuddin Hussein said that the search’s “main focus has always been in the South China Sea,” which is east of Malaysia and along the plane’s route from Kuala Lumpur to Beijing. Aviation investigators and national security officials believe the plane flew for a total of five hours, based on data automatically downloaded and sent to the ground from the Boeing 777's engines as part of a routine maintenance and monitoring program. Acting Defense Minister Hishammuddin Hussein was referring to reports that the Rolls Royce engines aboard the Boeing 777 automatically sent data to the engine manufacturer as part of a maintenance program. Hishammuddin said Thursday that both Rolls Royce and Boeing said that report was wrong. Yesterday, a Chinese government agency revealed satellite images of what appeared to be three floating objects in the South China Sea. However, Malaysia's civil aviation chief Datuk Azharuddin Abdul Rahman responded by saying no plane debris was found at the spot shown by China’s satellite images, according to the Associated Press.